It's a celebration of life. The band will be a surprise at the end of the service. They'll come in from the back of the room, walk down the aisle, continue playing a couple of songs on stage, then walk out with crowd behind them and continue playing for the release of various balloons. Arriving on the music scene in the late 19th century, Mariachi Bands brought an upbeat yet traditional sound to Mexican culture. With a blend of guitars, violins, trumpets, the guitarron, and the vihuela, Mariachi music can truly liven up a party! The upbeat authentic Mexican folk music is the perfect accompaniment for wedding receptions, Cinco de Mayo parties, and so much more. 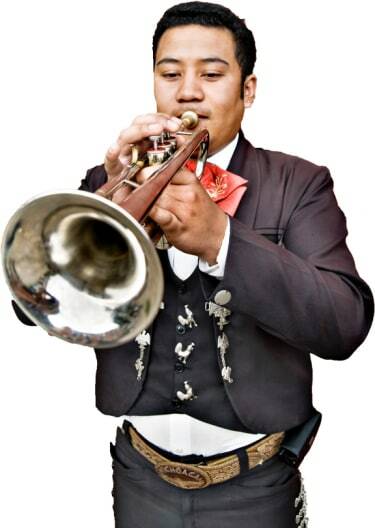 Search for Mariachi Bands in Indianapolis, Indiana above. Please note that these Mariachi Bands may also travel to Beech Grove, Bentonville, Southport, Speedway, New Palestine, Clermont, West Newton, McCordsville, Camby, Whiteland, Zionsville, Fairland, Avon, Brownsburg, Greenfield, Finly, Boggstown, Fortville, Mooresville, Fountaintown, Maxwell, Westfield, Bargersville, Pittsboro, Whitestown, Brooklyn, Ingalls, Pendleton, and Lebanon.